The owners of the Anchorage business that began with Moose's Tooth Pub and Pizzeria say they're hoping to transform an empty former Mexican restaurant on Spenard Road into the city's first-ever "food hall." Matt Jones, who opened Moose's Tooth with Rod Hancock in 1996, told the Spenard Community Council on Wednesday night that the idea is a version of a food court, with about 10 local vendors populating both floors of the building at Spenard Road and 26th Avenue. "Basically, think of them as indoor food trucks, food carts, with common open spaces between them," Jones said. Jones' presentation was the first public outline of a redevelopment plan for the 1980s-era building that once housed La Mex restaurant, a Spenard institution for decades. The property and building was purchased in December 2013 by the property company that is majority owned by Jones and Hancock. The building sat empty while the owners were involved in other projects, like the construction of a new Alaska Rock Gym, Hancock said in an interview Thursday. He said the food hall proposal isn't a done deal yet and is in the very early stages of design. But it's an ambitious next step for the food, beer and entertainment business that enjoys immense popularity among both locals and visitors. Since the opening of Moose's Tooth, the business has expanded to include a brewery as well as Bear Tooth Theatrepub and Bear Tooth Grill, which are two blocks away from the old La Mex property. Food halls, generally defined as large open spaces with local food vendors and occasionally shops, are fast-casual establishments that have spread rapidly across the Lower 48. From 25 food halls in 2010, real estate analysts expect more than 300 to open by 2020, the Washington Post recently reported. The spaces, which tend to attract foodies, can be found in New Orleans, Louisiana; New York, New York; Arlington, Virginia; and Austin, Texas. Hancock said he visited one in Portland that he particularly liked. He said he hoped the Moose's Tooth version would have a community feel, with spaces designed specifically for tenants. He said the plans also include a tasting room operated by his business' brewery. There will be outdoor seating for the summer months, but that's a short season, he added. "It's an extension of the food truck concept, which is a variety of food under one roof," Hancock said. "And yet, it's under a roof, because it's Anchorage." West Anchorage Assemblyman Eric Croft, whose district includes Spenard, said the idea of an Anchorage food hall is "really intriguing." He said there had been a lot of rumors, and worry, about the former La Mex building ever since the Moose's Tooth owners bought it. "It's a new thing to me," Croft said. "But these guys have such a great track record bringing great ideas, I think everyone wants to see what they do next." Much would need to be done to bring the old building up to code, Jones said. That includes adding an entirely new entryway and an elevator to make the second floor accessible to those who can't climb staircases. He said the new food hall would occupy the two stories of the building, with between four and five vendors on each floor. The vendors would be mostly permanent, though there would be some turnover, Jones said. The outside of the building, meanwhile, will be "modernized," Jones said. He said the owners were working with a team of architects and engineers and hoped to start permit applications in October or November. At the meeting Wednesday night, members of the Spenard Community Council meeting peppered Jones with questions about the project. One of the biggest questions was parking. For years, Bear Tooth customers have struggled to find spots and avoid aggressive tow trucks on private lots in the area. After buying the former La Mex building, the owners hung signs in the large parking lot saying it was available to Bear Tooth customers. Jones and his business partners have filed a petition with the city that asks for less parking than would be required under the city's standard calculations. That's because the planned remodel of the new entryway adds more space, which in turn generates more parking in the city's formula, LaQuita Chmielowski, an engineer with DOWL who is working with Jones and his partners on the project, said at Wednesday's meeting. "This is the first of its kind in Anchorage, so it doesn't fit nicely in any kind of category when it comes to parking," Chmielowski told members of the Spenard council. The city planning department received a preliminary application Wednesday for a parking variance at the site, said Dave Whitfield, manager and platting officer in the city's current planning division. Chmielowski said the application is set to go before the city's Urban Design Commission in November. While some suggested the city should find ways to foster shared parking in Spenard, Jones said he and his partners were looking in the short term at re-negotiating an agreement on the parking lot for Chilkoot Charlie's as one way to ease congestion. The Moose's Tooth owners also bought the Chilkoot Charlie's building and lot several years ago. Lindsey Hajduk, a volunteer with the group Bike Anchorage, told Jones he should consider bike parking. She said his business could be a leader in encouraging biking over car traffic. Jones said he was worried about theft from outdoor bike racks. But he also suggested he and his partners were seriously considering indoor bike storage in the new building. The other big question at the meeting was about the fate of the metal "La Mex" cactus sign that stands outside the building. Jones said there may have been some sort of deal involving the cactus in the sale. Either way, he said, there isn't really a plan for it yet. 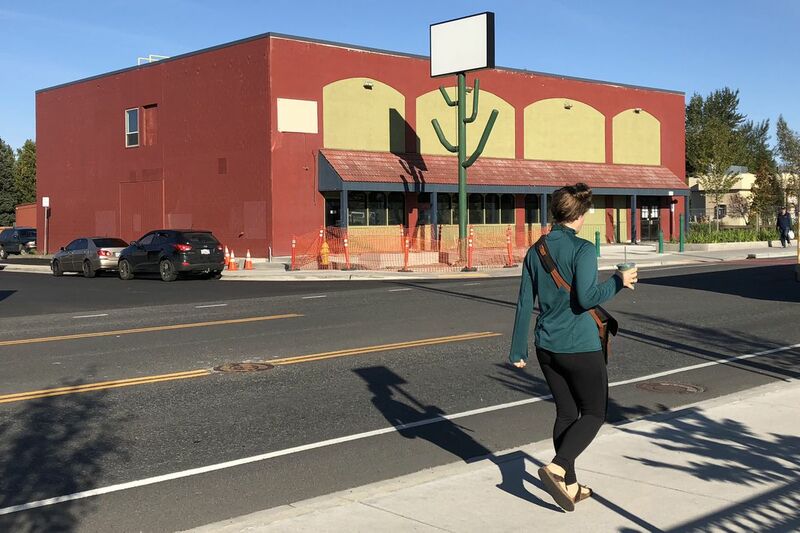 Croft said the cactus has become part of the landscape of quirky Spenard art, like the windmill and the neon palm tree that was recently returned to the neighborhood. "We do want the cactus," Croft said.